How did Federal Express become FedEx? FedEx, previously known as Federal Express, is a major player in the package delivery market and a direct competitor to global leader, United Parcel Service (UPS). Unlike UPS, the FedEx story is a relatively short one with the company only being founded by current chief executive, Fred Smith, in 1971. However forty years later, the company has the world's largest airline in terms of freight tons flown and the worlds fourth largest in terms of fleet size has almost 300,000 employees and sales revenue in excess of $40 billion. Fred Smith developed the idea of a global logistics company when he was a student at Yale University, with other notable students such as future President George W. Bush and Democratic presidential candidate John Kerry. After graduating from Yale, Smith began Federal Express in 1971 with his $4 million inheritance from his father and $91 million of venture capital. He based the company on the ideas that he developed at Yale, focusing on an integrated air-ground system. He started the company at the Little Rock national airport in Arkansas, but after two years of lackluster co-operation with the airport, Smith moved the Federal Express operation to its current location in Memphis, Tennessee, which was Fred Smith’s hometown. Federal Express started air operations from the Memphis airport on April 17, 1973, with fourteen Dassault Falcon 20 jet aircraft that were used to move packages between twenty-five cities. The first three years of operation saw the company lose money despite being the most highly financed new company in US history, in terms of venture capital. It was not until 1976 did the company see its first profit of $3.6 million based on 19,000 packages a day. The deregulation of the airline industry in 1977 meant that the young company was able to purchase large jet aircraft to increase the number of packages that could be transported per day. Federal Express bought seven Boeing 727 aircraft shortly after deregulation followed by Boeing 737 aircraft. The company increased its profit in 1977 with $8 million on sales of $110 million. The company had 31,000 regular customers, including such IBM and the US Air Force, which used Federal Express to ship spare parts. Federal Express became a public company in 1978 which raised capital for further expansion. The year after going public the company made a profit of $21.4 million on sales of $258.5 million with 65,000 packages a day to 89 cities across the United States. As the 1980’s began companies started to increase their use of overnight delivery services and away from the United States Post Office. Federal Express started competing directly with the Post Office by introducing the document sized overnight letter which could contain two ounces of documents for a flat fee of $9.50. This service made Federal Express the company with the largest sales of any US air freight company, ahead of Emery, Airborne Freight, and Purolator Courier. In 1984 FedEx made its first acquisition, Gelco Express, a Minneapolis-based package courier that served 84 countries. To develop overseas markets, Federal Express made acquisitions in Britain, the Netherlands, and the United Arab Emirates (UAE). In 1985 the company looked to develop an international presence and expand its services to Europe by opening a European hub at the Brussels airport. By 1987, Federal Express was providing service to about 90 countries and had landing rights in five airports outside the United States, at Montreal, Toronto, Brussels, London, and limited rights in Tokyo. To further expand international delivery, the company acquired Tiger International, for $883 million, and its heavy-cargo airline, Flying Tiger Line. Federal Express gained access to Tiger’s long-range fleet which included 22 Boeing 747, 11 Boeing 727, and six DC-8 aircraft. The 1990s found Federal Express with competition in the US from UPS introduced volume discounts attracting many of Federal Express’s customers. International operations were costly for Federal Express with falling profits on increasing sales due to the cost of developing the overseas markets. To increase capacity and decrease costs, the company shed its Boeing 727 aircraft for Airbus A300 aircraft. In 1994 Federal Express adopted “FedEx” as its official name and a year later purchased air routes from Evergreen International to start services to China and opened an Asia and Pacific hub in Subic Bay International Airport in the Philippines. 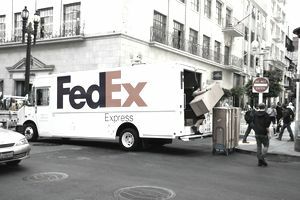 In 1998 FedEx acquired Caliber Systems and created the FDX Corporation. The purchase of Caliber meant that FedEx obtained the small-package carrier RPS (now FedEx Ground), less-than-truckload (LTL) carrier Viking Freight (now FedEx Freight West), Caliber Logistics, Caliber Technology and Roberts Express (now FedEx Custom Critical). FedEx now has a fleet of over 700 aircraft including Boeing 757-200, 767-300F, and 777 Freighters. It is the worlds largest fleet of aircraft and FedEx is the largest operator of the Airbus A300, Airbus A310, ATR 42, Boeing 727, Cessna 208, McDonnell Douglas MD-10, and the McDonnell Douglas MD-11 aircraft. FedEx replaced all their Boeing 727-200 aircraft in 2016 with Boeing 757 planes, which are 47 percent more fuel-efficient than the 727 aircraft. This is despite Boeing ending production for the 757 back in 2004. FedEx purchased used 757 aircraft from other airlines at a cost of $2.6 billion. FedEx was to be the launch airline for the Airbus A380 Freighter but canceled its orders after two years of delays. FedEx replaced the orders for the A380F with orders for the established Boeing 777F.